THE CARTEL IS AN EXTENSION OF THE 'CUPCAKEs WITH CAL' BRAND. It consists of a group of HAND SELECTED athletes from all cake walks of life who share a love for triathlon. The Cartel sees triathlon as a tool where we can support and share experiences together. We pride ourselves on our very close knit network. we provide a platform where people can be themselves, transcend social, DEMOGRAPHIC and geographical barriers. Wherever you are in the world, if you're part of the Cartel, you're always connected. WE PRIDE OURSELVES ON THINKING OUTSIDE THE BOX. NEW IDEAS AND CONCEPTS WHICH WILL PROVIDE VALUE TO MEMBERS OF THE CUPCAKE CARTEL WILL EVOLVE THROUGHOUT THE YEAR. In a sport where many athletes take themselves too seriously, we want to remember that we do this all for the love of the sport and the unique people in it. We value those who are authentic. Bakers are also highly valued. Life is too short for fake butter or people. The cartel is about bringing people together and building a network where we lift each other up and share knowledge. We want to share in your triathlon journey and adventures. We want to meet up for training and races. We want to share memes. We want to encourage more women to dip their toes into our great sport. Lead by our professional athlete Alise, we will ensure our ladies are nurtured and well looked after. In the buffet of life, women are the sweet dessert. TEAM MEMBERSHIP for 2019 opens october 24th. Q. GET ME IN THERE COACH, WHEN DO MEMBERSHIP APPLICATIONS OPEN? A. October 24th through November 7th 2018. The applications will be reviewed as we receive them, and the successful members notified via email and social media on November 21st. Q. WILL YOU ACCEPT EVERYONE WHO APPLIES? A. No. The Cupcake Cartel will be exclusive. This is not a high volume "revenue generating'" team. We have our values and have stated the culture we want to build and aim to attract people who share these values. Q. I HAVE MY OWN COACH/SPONSORS/TRIATHLON CLUB. will this be an issue? A. No. We are not a coaching service, triathlon or motorcycle club, yet. We STRONGLY encourage our athletes to maintain any other networks and sponsors which they currently have unless these are incriminating, in which case "No, we don't have money to cover your bail". Q. Will you provide a coaching service? A. Currently we are focusing our efforts on creating the best possible team. In 2018 Alise began offering a coaching service (Click here) for athletes who were looking to improve their performance. Currently Cal’s hands are full between training, racing and managing the team and wont be looking to burn the candle by offering coaching. Q. Will I have to race in the team kit? A. When you see the Cupcake Cartel team kit, you will WANT to race in it! We have sought the best designer and material and trust that it will compliment your current diet fad. Whilst there is no rule that you must race in the team kit, we encourage all team members to represent the kit proudly! 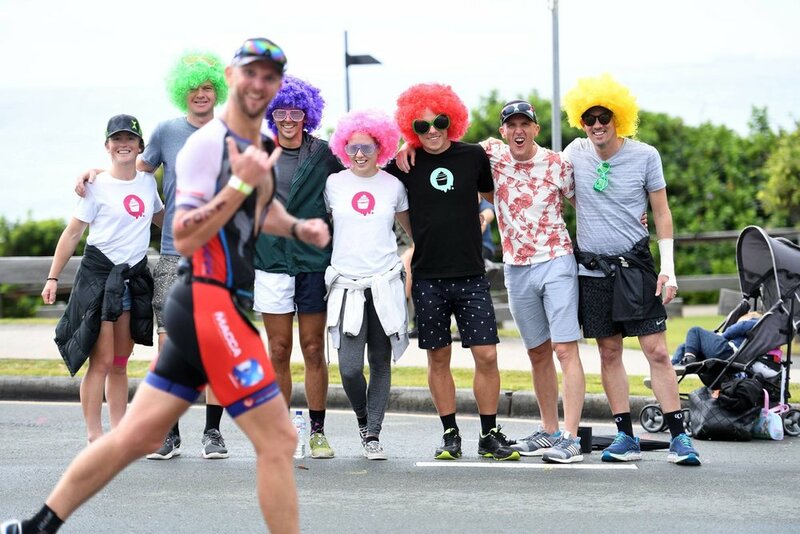 Kona qualifiers who choose to take the free QR frameset or Roka swim skin are required to race in the team kit at Kona. You are able to add your logos to the team uniform or headwear. Q. DO I HAVE TO BUY THE RACE KIT RIGHT AWAY? A. No. We understand everyones financial circumstances vary. We have negotiated extremely good deals on custom designed team kits. Team race kit, cycle kit and other custom team apparel is only available to team members. You will be able to purchase this throughout the year. Q. DO I HAVE TO BE FAST TO BE ON THE CUPCAKE CARTEL? A. No. Although our dog sitter charges by the hour so your efficiency to get around the course will be appreciated. We have athletes of all abilities, some speedier than others, and others who get great bang for their buck by being on the course longer than others. q. I don't actively race. Can I join as a "supporter"? Q. why do i have to pay to be part of the team? A. The annual fee covers the ongoing support from Alise and Cal as well at the infrastructural costs incurred with setting up and running a team. We use the membership fee to cover the cost of the team pack. The fee is in line and in most cases, much lower than most all teams we have inquired with. We have spent a significant amount of time negotiating contracts with our partners and the responsibility lies with us to ensure these are fulfilled. It is our role to ensure we leverage ourselves and the Cartel to offer exceptional value to our partners. We have negotiated excellent deals with all our sponsors and suppliers and believe we will exceed your expectations and experience for 2019. Q. WHAT IF I LIVE OUTSIDE OF USA OR AUSTRALIA? A. We will provide shipping details to team members upon application approval. There will likely be an added cost for shipping outside of these two countries, however, we will do our absolute best to find the most effective and economical method. 50% of our team is from the greater US so don’t pigeon hole us as an Australian team. We want you to have a great experience being part of an exciting and innovative team. We want you to feel part of something special. Therefore we want you to wear our team kits and apparel with pride and a sense of belonging. Look after your fellow cartel members, support them online and in person. Rally behind them when you can see they're going through a bad patch and celebrate their successes. Branding is everything. If you're seen to be having fun, more people want to be part of this. We're here to build a desirable brand and create an environment that you're proud of. We're not enforcing constraints or compulsory social media postings. If you're fizzing at the bung with your new team members, team product or team environment, post about it. Speak highly about it. Thats all we ask. Sincerity goes a long way. Thank you! We reply to everyone, so please check your Junk/Spam folder if you havn't heard anything within 24hrs. We're not Junk. We're delicious!